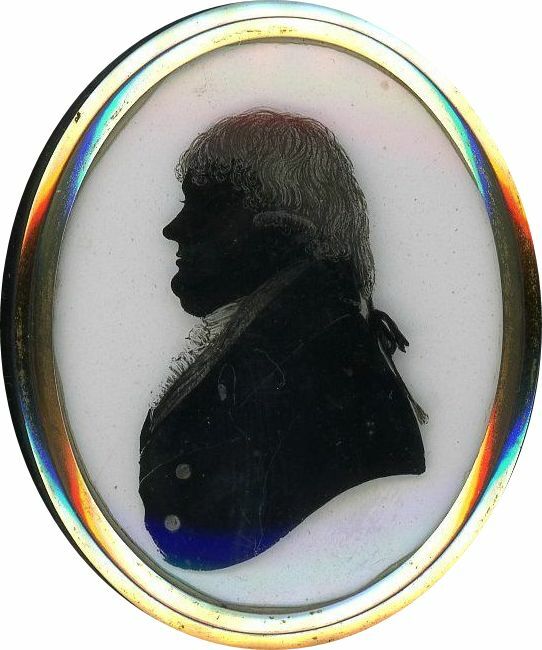 A well-delineated bust-length silhouette of a rather imposing gentleman named Mr Coley with a rounded face and double chin. He is dressed in a double-breasted coat over a frilled chemise and stock. It appears that Mr Coley was a ‘guinea pig’ as he is wearing a pigtail wig tied with a ribbon bow despite the introduction of the Hair Powder Act of 1795 that levied a tax of one guinea a year on wig powder. There were though a few exemptions, one being clergymen on less than £100 a year whilst a father with more than two unmarried daughters also got a concession. 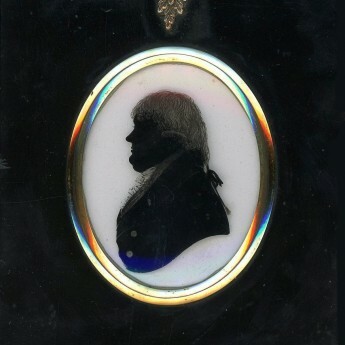 The silhouette is reverse painted on convex glass in solid black with thinned pigment used for the hair and shirt frill. Other costume and hair details have been scratched in using a needle. 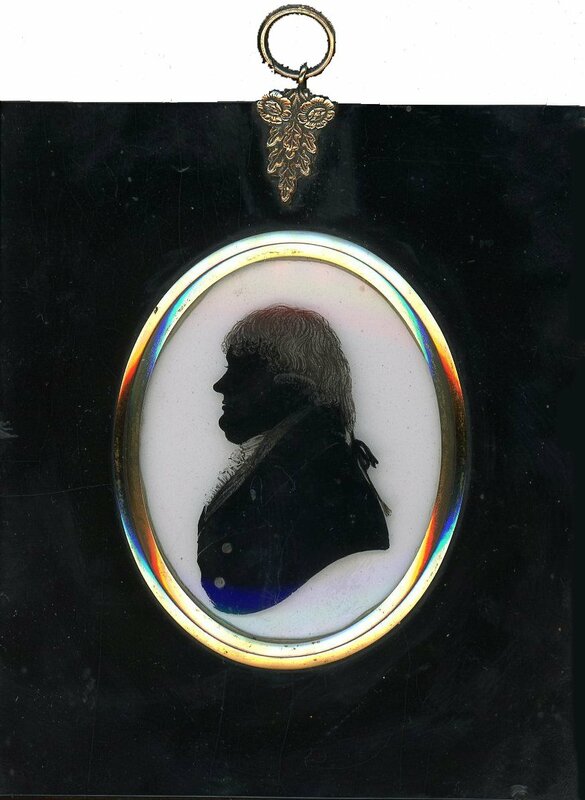 The profile is backed with plaster and is set in the original papier-mâché frame with a floral hanger. It is backed with the artist’s trade label used whilst his studio was at no. 12 Union Street, Bath. 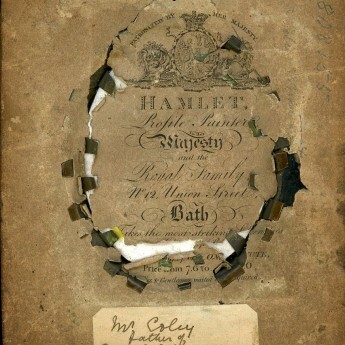 William Hamlet the Elder is believed to have been a French émigré who eventually settled in Bath where he had a studio between 1785 and 1816. He included royalty amongst his clientele and his trade labels were headed by the Royal coat-of-arms and by the proud boast ‘Profile Painter to Her Majesty’ (i.e. Queen Charlotte). 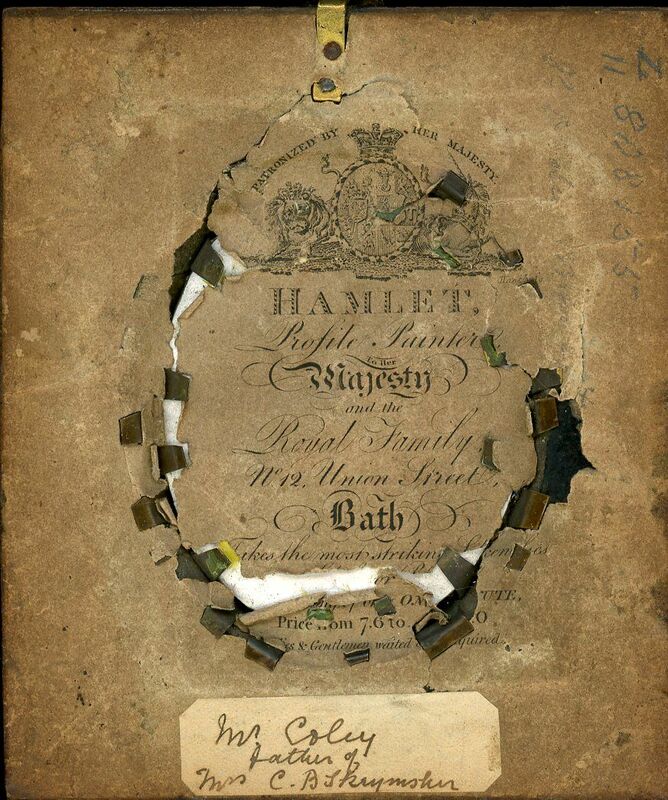 Hamlet’s son was also a silhouette artist though he pre-deceased his father.